Senior Scouts from Troop 353 helped to serve breakfast at the annual Martin Luther King Breakfast sponsored by the Eastchester Community Action Program at The Reformed Church of Bronxville. ‘A Scout is helpful!’ [Here’s a story on the event in the Journal News]. 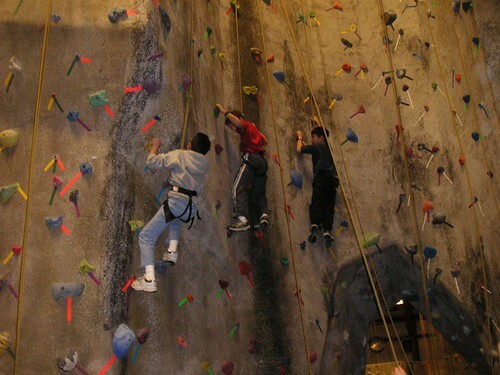 Troop 353’s rock-climbing program got off to a great start just before the end of the year with an outing at The Rock Club facility in New Rochelle. One group of Scouts began their three-part merit badge work, while another group just hit the impressive range of formations. 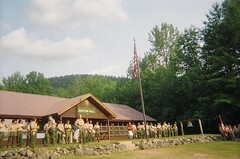 See the photos at our troop Flickr site. Originally uploaded by Troop 353. With January temps in the 60s and 70s and overnight lows in the 50s, what else comes to mind but the good times at Camp Read in the summer? Here’s a picture from last year to remind everyone in Troop 353 that it’s not too early to start planning for summer camp – a great week for advancement, friendship and fun! Scoutmaster Tom McCandless is hoping to increase the troop’s participation this July. If you need more information, speak with Tom or any of the Scouts who went last year. Note to Troop 353 Scouts and parents: we have added a permanent “tab” to the top of each page’s navigation – you can always click on the Troop Calendar link to get the most up-to-date schedule for the troop. We are also experimenting with use the web service 30 Boxes to create a more interactive calendar – please let us know what you think! Here’s the link. Finally, we’re going to try and centralize troop photos on a Flickr account, which will also display photos here and help us to manage what we hope will be hundreds of great pics. Here’s the link (only Camp Read pics so far) or you can click on the sidebar links. For the Troop 353 community, here are some key documents you may need from Scoutmaster McCandless.